A method of calibration of devices used to measure energy by means of a calorimeter and reference photodiode is described. Experimental results of the calibration are presented. Through the use of the method, energy meters, photodetector devices, and radiation sources may be calibrated over a range more than 108 times the measured radiant energy with the use of time conversion. Translated from Metrologiya, No. 4, pp. 3–16, October–December, 2018. A. Ryer, Light Measurement Handbook, www.intl-light.com/handbook, acc. 03.20.2018. 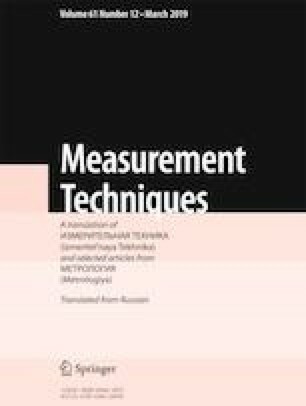 E. V. Kuvaldin, “Counting method for measuring and linearity checking photometry devices,” Measur. Sci. Rev., www.measurement.sk/2010/S1/p.html, acc. 05.01.2018.